Columbia's ill-fated final mission, STS-107, launched in January 2003, while Expedition 6's crew of three was living aboard the International Space Station. STS-107 was one of the last space shuttle missions that did not dock at the International Space Station. So, with the exception of the world's first long-distance extraterrestrial chess match between Station and Shuttle crew members, there was little interaction between STS-107 and Expedition 6. However, the tragic Columbia accident had an immediate, serious effect on Expedition 6's mission. The disaster grounded the space shuttle fleet indefinitely, so the three astronauts' expected ride home - the Space Shuttle Atlantis - did not come to pick them up in March 2003. In fact, it was over two years before another space shuttle mission would fly again. 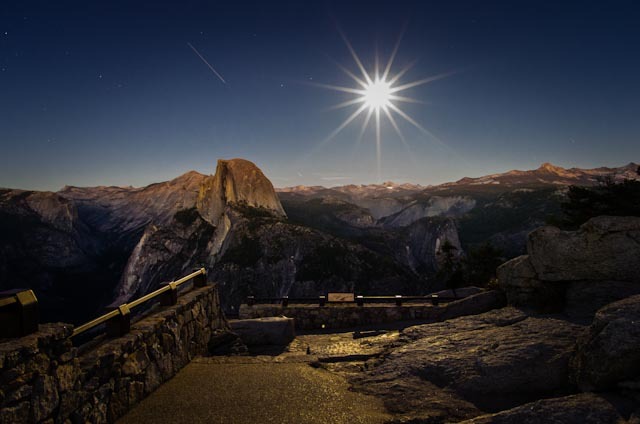 The trail of the ISS across the sky, and a full moon, viewed in Yosemite National Park. 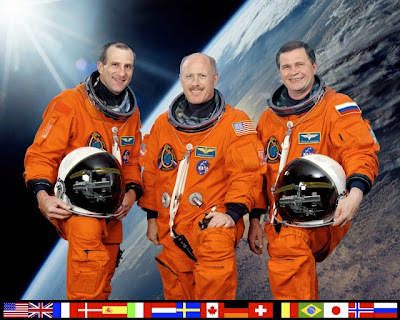 Without space shuttles launching, Don Pettit, Ken Bowersox, and Nikolai Budarin's only option for getting home was the Russian Soyuz escape capsule docked to the ISS. 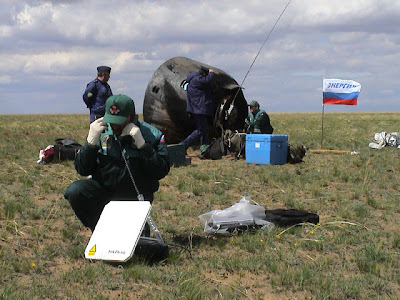 So the three men spent an extra month and a half in space and in May 2003 they hitched a ride home on the Soyuz, landing safely in the hills of central Kazakhstan. Expedition 6, soon after the recovery crew arrived. The ISS can't stay untended for long, so NASA and the Russian Space Agency had to cobble together a last-minute Expedition 7 to replace Pettit, Bowersox, and Budarin. Even with the ISS's amazing recycling capabilities (every drop of water aboard the station -- the vapor the crew exhales in each breath, their urine, water evaporating from drying laundry -- is recycled) the station still requires constant resupply of hydrogen, oxygen, food, and space parts. 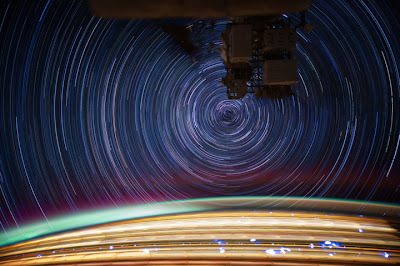 Long-exposure photo of stars taken on board the ISS. 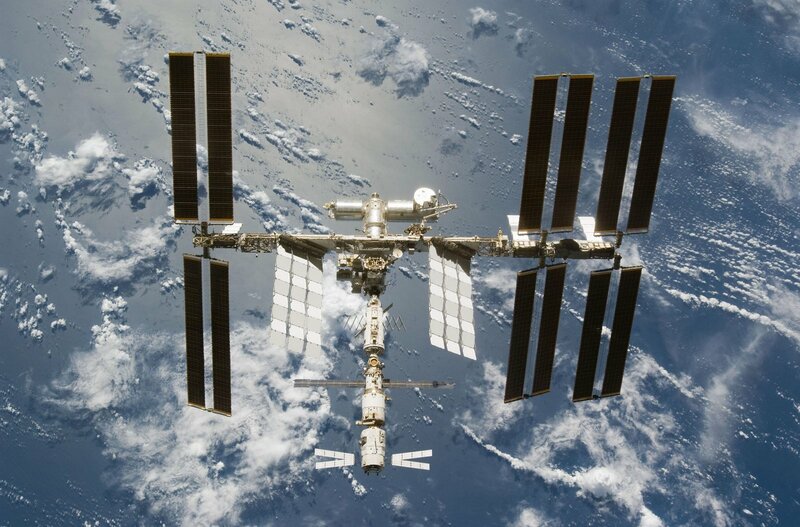 As an aside, I should mention that even though the Station is dependent on Earth, it does recycle enough hydrogen and oxygen to save $700 million a year in the cost of replenishing supplies. 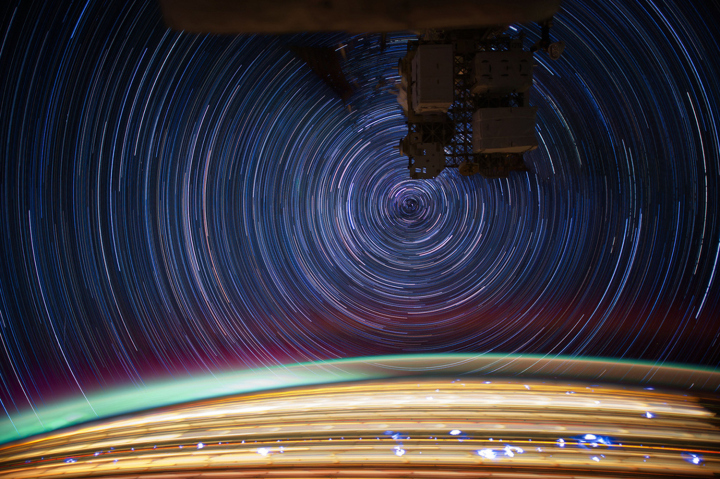 Chris Jones' Too Far From Home provides an example of just how this recycling works in practice: Pettit's favorite snack in orbit was bread and honey, and he'd use a disposable wet wipe to clean up the sticky mess after eating. Before throwing away the used wet wipe, he'd leave it out to dry for a few hours. That way, the ISS recycling system could reclaim the tiny bit of water in the wet wipe! International Space Station Expedition 6 Crew. Without the space shuttles flying, there weren't as many supplies being ferried up to the station. This meant that Expedition 7 was crewed by only two men instead of the usual three: Astronaut Ed Lu and Cosmonaut Yuri Malenchenko. 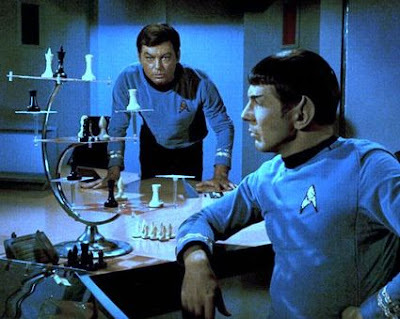 Both men were veterans of multiple past missions, and had flown together (and gotten along quite well) during a 2000 Atlantis mission. After they were picked, Ed had just a few short weeks to train for his unexpected Soyuz launch. Expedition 7. Lu added an STS-107 mission patch to his suit before the launch, in honor of Columbia's last crew. Launching in April with a bunch of extra supplies, the two men spent just a just a few days on the Station with Pettit, Bowersox, and Budarin before Expedition 6 returned to Earth. 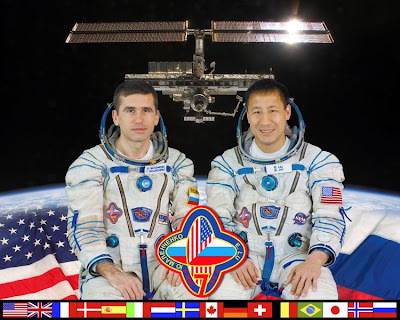 Then, for the next nearly five months, it was just Lu and Malenchenko in Earth orbit... except for a few hours on October 15, when they were joined in outer space by Chinese astronaut Yang Liwei, whose capsule orbited 40 miles below the Station. 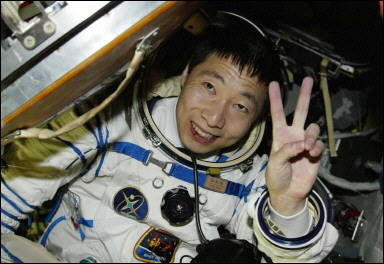 Astronaut Yang, after completing China's first manned space flight! Ed Lu and Christine Romero, back at Johnson Space Center after Expedition 7's return. Malenchenko and his fiance Ekaterina Dmitrieva took advantage of a quirk of Texas law that allows a wedding to proceed by proxy with one party absent. Kat Dmitrieva, a Russia-born Texan, walked down the aisle of an auditorium at NASA's Johnson Space Center in front of several hundred guests. 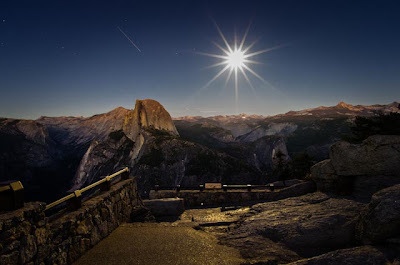 Meanwhile, floating about 240 miles above New Zealand, Malenchenko hovered in front of a video camera and TV screen, with Ed Lu, his best man and only witness, floating beside him. Lu played "here comes the bride" on the station's electronic keyboard. Following the ceremony, everyone (except Malenchenko and Lu) enjoyed a wedding reception at a fancy restaurant nearby. A lifesize cardboard cutout of Malenchenko, bowtie added, attended the wedding reception. The extraterrestrial couple's road to the alter was not without a few bumps. 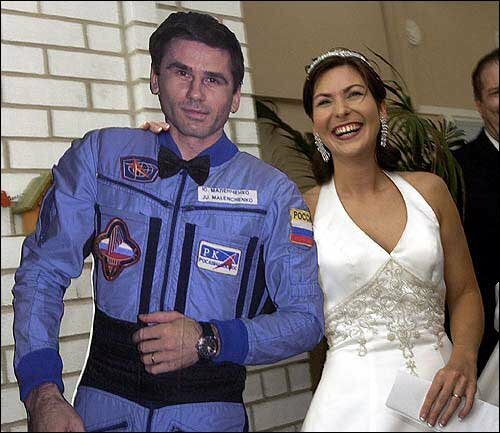 Apparently the Russian Space Agency was a little iffy about allowing the wedding to proceed... Malenchenko is a military officer, and there are restrictions on marriages between officers and foreign citizens. But eventually they gave the wedding their go-ahead. The couple will celebrate their ten year anniversary this July; they have one son. Lu and Romero are coming up on their ninth anniversary, and also have a child. A wedding chapel with a view. Sources: MSNBC; Florida Today; Wikipedia; and a great audio book I've been listening to lately: Chris Jones's Too Far From Home, the story of Pettit, Bowersox, and Budarin's time on the international space station following the Columbia disaster.